Find an updated list of 2019 ice skating venues here. Find the 2019 winter sports guide here. There are officially 90 days of winter (which can seem like a long time) so why not embrace the cold and snow and make the most of what this season has to offer? 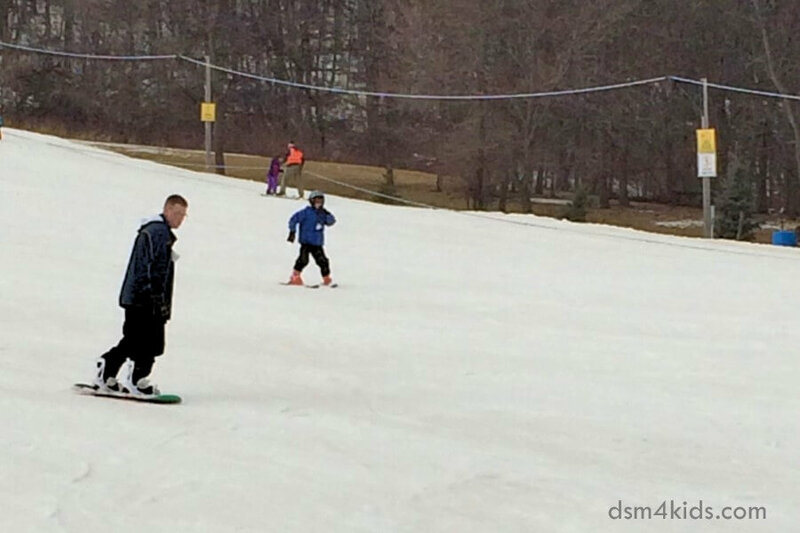 There’s no better way to enjoy a winter day than taking a spin on the ice, racing down a hill on skis or a snow tube with your children squealing in delight. Check out these spots where you can go ice skating and enjoy winter sports in Des Moines. Winter events can be finicky, if the weather is inclimate, icy or unseasonably warm, events may be cancelled. Please verify information before heading to an event! The community ice rink donated by the Iowa Wild and Wells Fargo is set up and wil be ready for skaters once the temperatures have dropped low enough for it to freeze. The ice rink is FREE and open to the public. Skaters must provide their own ice skates. Hockey skating hours are dawn to noon and open skating hours are noon to dusk. Go for a skate at the retention pond located west of Cascade Falls Aquatic Center in Ankeny. Ice thickness is rated on a regular basis and skaters should look for the green flag for safe skating conditions. If the ice is determined to be unsafe to skate, a red flag will be flying. You will need to bring your own skates to this unsupervised natural skating venue. Grab your mini ice dancers and go for a skate in downtown Des Moines. Weekends tend to be the most crowded, so it’s a win-win to take advantage of their lower weekly public skate rates. Refreshments (including snacks and hot beverages) are available at the concessions stand and skate rentals are available in kid and adult sizes. Brenton Skating Plaza also hosts birthday parties and Learn to Skate Classes. Admission: Monday through Thursday – Adults $8.00; Youth (age 6-12) & Seniors $5.00; Children 5 and under are always FREE; Skate Rental $4.50; Skate Aids $5.00. BYOS – Bring Your Own Skates. During the winter, Des Moines Parks and Recreation clears frozen ponds for ice skating at three neighborhood pond locations. When these facilities are open for skating, it is unsupervised and available FREE of charge during normal park hours – sunrise to sunset. A green flag indicates that ice depth and conditions are safe. If no flag is displayed, the public should assume conditions are not safe; the City of Des Moines Parks and Recreation asks that the public keeps off the ice and water at each POND when there is no flag displayed or if the flag is red. It was announced in May that the Iowa Wild American Hockey League Team and Wells Fargo would donate an ice rink to the City of Waukee for public use. The rink measures 80 x 40 feet and will be located seasonally at Sugar Creek Municipal Golf Course. Crews set the rink up in late November will fill it when temperatures drop low enough for a solid freeze. The rink will be open daily when weather allows, dusk to dawn. Bring your skates and take part in this new, free activity in Waukee. Located near the Softball Complex and Dog Park in Raccoon River Park, the Raccoon River Park Ice Rink will be open for skating throughout the winter season, weather permitting. An open/closed sign has been installed at the rink and will be updated by West Des Moines Public Services staff based on ice conditions. The rink is not supervised and there is no skate rental available. It’s open during park hours, dawn to dusk. *Unless otherwise noted, the official outdoor ice skating season is November through early March. Visit websites and social media sites for holiday and extended hours, and weather-related closures. Metro Ice Sports Facility is a tried-and-true arena open year-round for big (and little) wobbly Des Moines legs. They offer public skate most days of the week, but move it from rink to rink. Be sure to check their schedule for times. Skate rentals are available for both kids and adults. The Facility is a happening place with hockey leagues and games, learn to skate lessons and birthday parties. Think that there’s nowhere to downhill ski or snowboard near Des Moines? Think again! Seven Oaks Recreation Center has been operating for 19 years and has everything you need to enjoy a day on the slopes without venturing too far from home, including lessons and equipment rental. They also offer snowtubing if you’re not into skiing. Active Endeavors is a local retail store that specializes in outdoor apparel and accessories. They rent out cross-country skis, boots and poles and snowshoes during the winter. . Cost: Snowshoe rental is $15 for one day and $25 for two. Cross-Country sets are $17 for one day and $28 for two. A $100 deposit is required. Des Moines Parks and Recreation has several opportunities for you to explore the outdoors during the winter. They typically schedule several snowshoe hikes and ice fishing events. If there is inclement weather, events will be cancelled. To find out more details about these programs or to register, visit their website and keep an eye on their Facebook page. Cost: All events require registration and most have a $5 fee that includes snowshoe rental, instructions and hot chocolate. Bring your family and friends to The Neal Smith National Wildlife Refuge and do some snowshoe hiking. Snowshoes are available for visitors to use at no cost. Hikes are typically held on Saturdays; dependent upon snowfall. Check their Facebook page or join their email list to know if there is a hike. 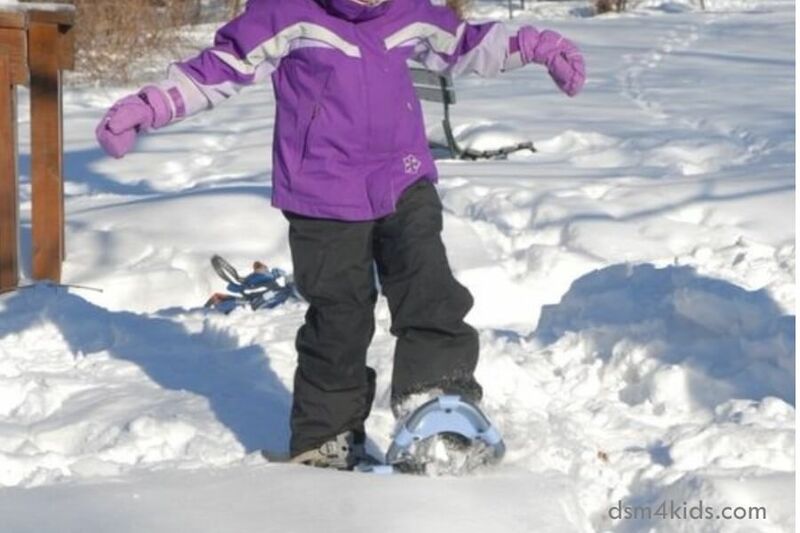 Cost: Snowshoe rental is FREE and both child and adult sizes are available. Registration is encouraged. If you’d like to try cross-country skiing or snowshoeing, consider renting a pair from the Polk County Conservation Board. They have several sets of cross-country skis, boots, and poles available for rent. The equipment is sized mainly for adults and can be reserved in advance. Equipment must be picked up and dropped off at the Jester Park Administration Office during normal business hours, Monday through Friday, 8:00 am to 4:30 pm. Skis will only be rented if there is at least four inches of snow on the ground. Cost: Cross country skis, boots and poles rent for $10 a day. Rasmussen Bicycle Shop rents out snowshoes and poles in men’s and women’s sizes during the winter months. Pick up your gear on Saturday and return it by close of business on Monday. Cost: Snowshoe rental is $12 a day; pole rental is $8 a day or get a break by renting both for $18 a day. They also offer a weekend Snowshoe/Pole Rental rate for $25. Join Warren County Conservation to learn how easy and fun snowshoeing and ice fishing can be. Snowshoes can be checked out for FREE at the Annett Nature Center in Indianola during business hours. They have snowshoe hikes and ice fishing classes scheduled throughout the season. Classes will be cancelled if there’s not enough snow or thick ice. 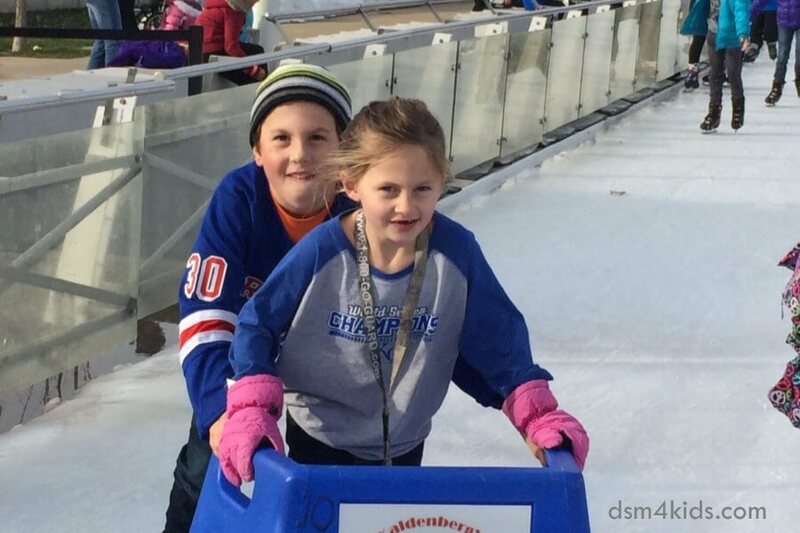 Where is your favorite spot to hit the ice or enjoy a winter sport with your family in Des Moines?